Add a half cup of white vinegar to the final rinse cycle in your washing machine to help dissolve the laundry detergent. It is a natural fabric softener and you won't be adding the artificial scents found in commercial fabric softeners. The vinegar smell will disappear when the clothes dry, so no need to worry about smelling like a salad. 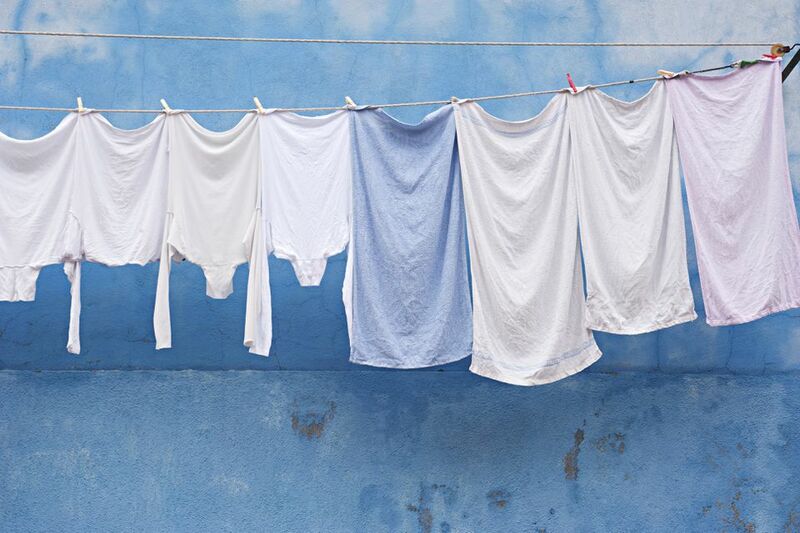 It is the residue of detergent left in your laundry that causes the clothes to be stiffer when you line dry them. Cut the amount of detergent that you use in the washing machine. Half the recommended amount is usually plenty to get your clothes clean. Run your clothes in the dryer for 10 minutes, before putting them out on the line. You won't use much energy if you run it on Air Dry, Fluff, or Low. The tumbling action and airflow will help fluff up the fibers and this can result in less stiffness when they dry on the line. Shake out your clothes before hanging them. This works similarly to tumbling them in the dryer, although probably less effective. But it's only your muscles expending energy. Just don't shake them into the dirt or grass, or you'll have to wash them all over again. Hang your clothes out on a windy day and the breeze will help fluff them so they won't be as stiff. This isn't always an option, but it might be an inspiration to do laundry if the wind is picking up. Take in your laundry when it is still just slightly damp and run it through the dryer for a final 10 minutes. If you waited too long and it's crisp and dry, toss it into the dryer with a clean, wet washcloth for 10 minutes. You will have saved using energy for a full cycle and your clothes will be less stiff. Your clothes dryer is a big part of your home energy usage and expense, especially if you have a family that produces laundry daily. Some estimates are that the clothes dryer alone accounts for six percent of home energy usage. That can be over $100 per year out of your pocket, and it's burning electricity or gas unnecessarily. It's up to you whether you can tolerate a little more stiffness in your laundry when you are saving energy, the environment, and your wallet. Got Fabric Softener and Dryer Sheet Stains on Clothes? Do Your Gym Clothes Stink?